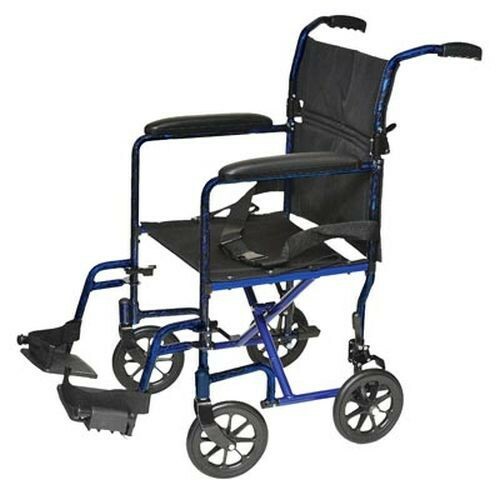 The Lightweight Aluminum Transport Chair by Invacare® weighs in at only 19 pounds making this wheelchair easy to maneuver when preparing for a transfer or lifting it into a vehicle. 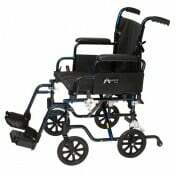 A lightweight transport chair is useful when moving patients short distances at home or in a hospital setting. The swing-away footrests help transfers be faster and more comfortable. 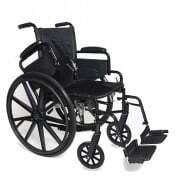 For added safety, it is important to use the push-to-lock rear wheels locks to stabilize the wheelchair before transferring. The frame compacts to 8.5 inches in width and is easier to condense using the fold-down back and seat carry straps. A nice feature about this transport chair is it's constructed with black nylon upholstery that's easy-to-clean, bacteria resistant and flame retardant for safety. The armrests are padded for added comfort to the user and a built-in seat belt for security measures. 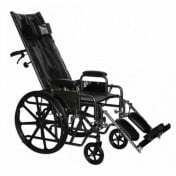 This newest Probasics Lightweight Aluminum Transport Chair now sports a higher weight capacity of 300 pounds. You may also be interested in extra padding by adding a wheelchair cushion. Before using the transport chair, make sure the back is locked securely. Make sure to regularly check hand grips for looseness. If loose and/or worn, replace immediately. Do not twist handgrips when chair has been exposed to extreme high temperatures, high humidity or becomes wet. This may result in injury or damage the chair. When sitting in chair do not reach down to grab an object to prevent falling forward. Do not lean backwards to reach an object to prevent the chair from tipping. Before transferring, turn both casters parallel to the object of transferring and engage wheel locks. 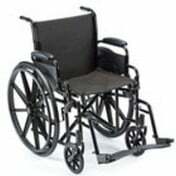 The net weight of the wheelchair is 19 pounds. You can fold it for travel at any time. 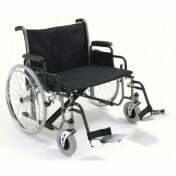 Is the wheelchair shipped fully assembled? The chair does not ship fully assembled. The recipient or caretaker of the product will need to put the chair together upon receiving the item.